Wow. I had, as usual, a very wonderful day with Charlotte and the lads at Chandos House residential addictions recovery home in Bristol yesterday. 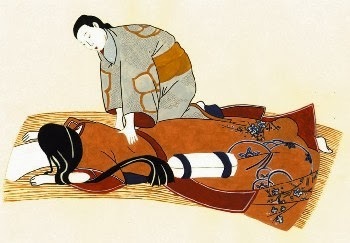 But the icing on the cake was to be treated, on the house, to a Shiatsu massage by therapist Doug Sawyer, who provides weekly massage to the residents. After taking details of my health, childbirth experiences and the like I was invited to lie down on my back. He worked various areas by applying pressure with his hands and asking me to comment on any areas which felt tender (plenty of those). I very quickly felt relaxed and had strange, almost indefinable sensations. Doug explained that he was working on my channels of energy (meridians) and apparently my kidneys are giving me a bit of jip. Throughout the hour I was very much in touch with my emotions and different things came to mind, for example, my first experience of giving birth which was a protracted, and, quite frankly, hideous affair (for me and my poor baby). Also, my mind turned to how I sometimes, when feeling emotionally stressed, have a tendency to see things from a rather skewed perspective. At this stage he was working around my heart (or Fire meridian) and as he did so I got in touch with a greater perspective to help fish me out of that skewed thinking - the realisation that I can come out of myself and take a cosmic perspective, and go into my inner universe and take on that perspective, then return to the here and now and view things from that place. This can help me to see something closer to the truth (if there is such a thing) and take me away from emotional reactionary behaviour (defensiveness, blame, anger). At this point I found myself laughing with relief at rediscovering this insight. Apparently, when the heart is strong and steady, it controls the emotions; when it is weak and wavering, the emotions rebel and prey upon the heart mind, which then loses its command over the body*. Still with me? After turning on my back, learning that my sacroiliac joint is dodgy (probably from the dodgy childbirths), and some more kidney work that involved Doug kneeling on the backs of my legs, the session ended. I felt very relaxed and yet energised afterwards. In fact, I didn't want it to stop. I felt very safe with Doug and would definitely have a Shiatsu massage again. Thank you to Doug, and to James Dickinson at Chandos House.